Odor perception is biased by verbal–semantic processes when cues on an odor’s source are readily available from the context. At the same time, olfaction has been characterized as basically sensation driven when this information is absent. In the present study, we examined whether language effects occur when verbal cues are absent and how expectations about an odor’s identity shape odor evaluations. 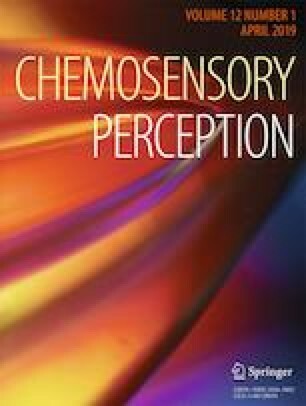 A total of 56 subjects were asked to rate 20 unlabeled odor samples on perceptual dimensions as well as quality attributes and to eventually provide an odor source name. In a subsequent session, they performed the same rating tasks on a set of written odor labels that was compiled individually for each participant. It included both the 20 correct odor names (true labels) and in any case of incorrect odor naming in the first session, the self–generated labels (identified labels). We compared odor ratings to ratings of both types of labels to test whether differences between odor and odor label evaluations were rooted in identification mechanisms. In cases of false identifications, we found higher consistencies between the evaluation of an odor and its identified label than between the description of an odor and its true (yet not associated) label. These results indicate that odor evaluations are strongly affected by the mental image of an odor rather than the actual sensory codes and that this mental image is built spontaneously. Our findings imply that odors and odor labels are evaluated similarly for identical objects and that the differences found in similar studies may have been rooted in different mental representations being evaluated. Odor sensations provoke odor naming without explicit demand. These self–generated hypotheses about an odor’s source exert a considerable semantic impact on odor perceptual processing, regardless of their accuracy. The online version of this article ( https://doi.org/10.1007/s12078-018-9247-9) contains supplementary material, which is available to authorized users.